Nick was keen to get on with some of the outstanding tasks. He cut a hole in the control column inspection plate for a 6 inch air intake grill. The marine surveyor had identified one was required to provide air for the engine. After that Nick went on to fit the GSM and GPS aerials. However, first Richard had to remove one porthole liner. I’d been thinking about the best route for the cables between the aerials and the GSM/GPS module. Last night I realised the best position for the module was in the cabinet under the gunwale. The cables could then be routed in the duct under the gunwale and then up into the bottom of a porthole liner. Nick drilled a 1” diameter hole up through the plywood lining on the gunwale and then through the spray foam on the wall to reach the porthole frame. 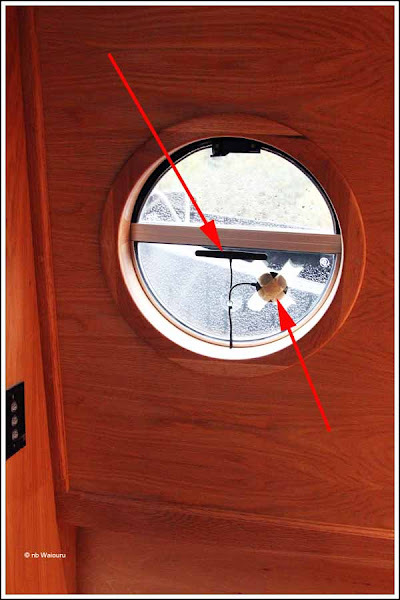 He then used a '”pull rod” to draw the aerial cables down through the wall lining before the porthole lining was re-installed and the aerials glued to the porthole window. In an earlier email I’d requested some advice from Mark Zimmerman (Atlantis Marine) on configuring (wiring) the remote control receiver and the GSM/GPS module. Using the information he provided plus some additional information from Andy I have been able to wire the receiver and then configure it to recognise the three buttons on the key fob. At the moment one button is configured to activate/deactive the alarm. 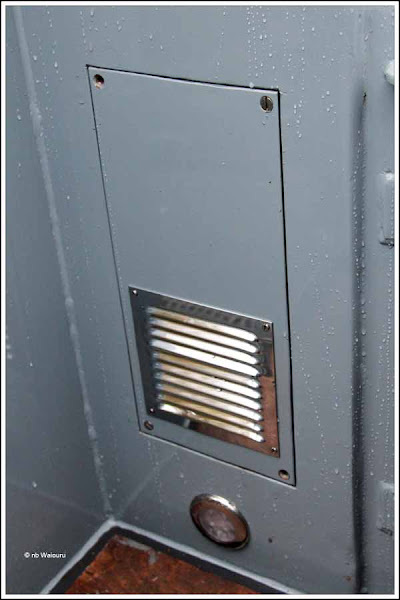 A second button starts/stops the Hurricane central heater. We’re unlikely to use this function and can probably reconfigure the button for another task. However it does mean we can keep the key fob beside the bed and remotely start the heater without leaving the bed. The third button activates/deactivates all the lights in the boat. The idea being the lights can all be turned on when leaving the boat in the dark or turned on when returning to the boat in the dark. I just need to work out how to put a delay on the function so the lights will turn off after a set delay. So if I remove the Hurricane heater button what else can I use it for? The GSM/GPS module will enable us to text Waiouru to start/stop any pre-configured function using a set of text commands whilst the GPS will tell us where the boat is or advise us by text message if Waiouru moves when we have left her unattended. So more progress made today! We're looking into a GSM alarm for AmyJo at the moment. Can I be nosey and ask which make you went for please, I like the key fob idea? If all you want is a a remote alarm you can probably purchase a 'stand alone' system rather than something as integrated as ours! However our complete system (alarm, remote, GPS & GSM) was provided by Atlantis Marine, the UK suppliers of the Empirbus system.